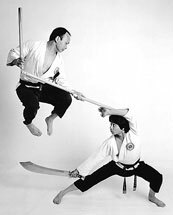 Grand Master C. K. Chang (8th Degree Black Belt) (left), the chief instructor, using a 3-section staff against a sword attack. Various weapons are taught in more advanced training. 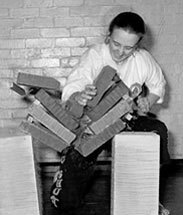 Trish Chang (7th Degree Black Belt), a senior master instructress and a Guinness World Record holder, chopping 4 building blocks to show the type of power that women can develop for self-defence. Formidable destructive power comes naturally as a by-product from proper training. Celia Sisman (5th Degree Black Belt) (right), a senior master instructress, using an effective kick – without having to dirty her hands – to floor her attacker. Men and women are trained to defend themselves effectively. The techniques of breaking and self-defence shown or described on this website require extreme skill and precision with split-second timing; some of them, especially those involving weapons, are dangerous even to well-trained Wu Shu Kwan experts. Wu Shu Kwan will not be responsible in any manner whatsoever for any injury which may occur in an attempt to imitate them.